Fourth of July Mini Wall Hanging Pattern includes full-size patterns, placement sheet, and instructions to make the 10 1/2" x 12 1/2" mini wall hanging. The technique is fusible applique. 43? X 58?. This a modern wall hanging from the book, "Oh Baby!" by Bear Paw Productions. With clean lines and a sleek look, it is sure to please. If you always wanted to work with wool or thought it might be fun, this is the class for you. Dortha will take you through the steps necessary to make beautiful things with wool. If you want to learn how to do your own bindings, how to do a mitered corner or how to join the two ends to have a nice flat join - bring your project(s) for a day of binding making and stitching. Julie will teach you the "continuous" bias binding method by following the handy "strip ticket". 32? x 63?. This sweet hanging begs for spring to come. From the book Mini Wonderful Curves by Jenny, this quilt goes together with ease using the QCR Mini ruler. 42? X 56? This quilt is constructed using half-square triangles for a very modern look. What is it? These sessions are for the quilter who wants expert help with a quilt or other related project. We provide expert instruction along the way to help you find the most effective way to complete the project you are currently working on. This class is offered for owners of the Featherweight sewing machine. These sessions are set aside to work on any of the projects in the book, ?Home Grown?, by Nancy Halvorsen. Get the help and instruction you might need to complete some of these fun projects. 12" x 53". What a great fun summer table runner by Fig Tree Quilts. What says summer more than popsicles! Make this table runner and quilt it yourself during class. 43" x 52" This quilt, from the book "Oh Baby" by Bear Paw Productions, is a great wall quilt. Featuring bright colors and a modern design, it is very pleasing to the eye! 60? X 60? This cheerful quilt is all poppies and pinwheels and is sure to delight! Come for a day of making blocks for Quilts of Valor. Space is limited and there is no charge if you are sewing blocks for Quilts of Valor. Call today to reserve your spot. Come learn to use rulers on your domestic sewing machine to create beautiful free motion designs with Deloa Jones. Deloa has been doing long arm quilting for Quilts Plus for many years, and has developed a line of rulers for long arm machines. Now she has a line of rulers that allows you to use your regular sewing machine to achieve long arm results. Requires a special foot that allows for sewing next to the ruler. We carry this foot at Quilts Plus. This is the bag everyone wants! Pockets all the way around on the outside, pockets all the way around on the inside! Heavy duty stays that keep the bag?s mouth wide open, easy to get in and reach all your important tools. The box tote is the same bag, but sized for your Singer Featherweight! (can be made in multiple sizes) You?ll be amazed by how simple curves can be with this pattern. 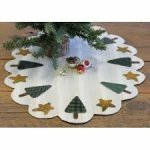 It comes with the three acrylic templates you will need to create a unique quilt. Pattern can be made in any size from wall quilt to king sized quilt. Come join a group of ladies who are very excited about working with wool. Bring any wool project that you wish to work on and get inspired by what others are doing. If you like hand work, you will find wool appliqué easy and fun. We meet once a month on the third Monday.